This is another Hugh Fairly-Longname recipe. My addition was to marinade the lamb chops in Pomegranate Molasses for about an hour before cooking which makes them sticky, sweet and shiny when cooked. Firebomb a pan with as much garlic as you can find (well a whole bulb). Brown the lamb chops in the same pan. 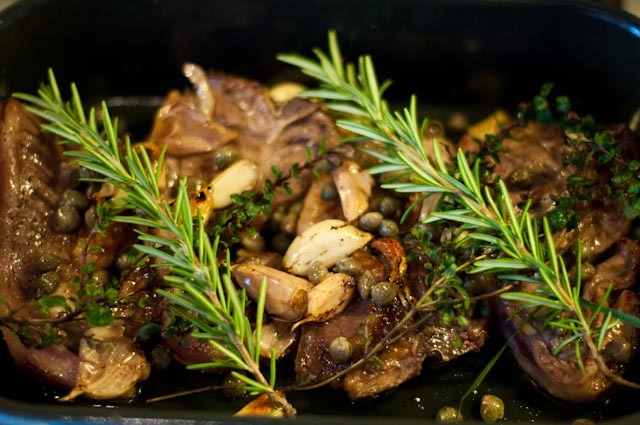 Put lamb and garlic in a dish that’s been heated up in a 200 degree c oven. Add two tablespoons of capers, large amounts of Rosemary and Thyme (preferably fresh from the allotment or stolen from a hedgerow). Add a glass of white wine to the pan that you browned the lamb in and reduce. Chuck on top of the lamb and cook in the oven for 15-20 minutes.